Belleville Clinic faculty and staff: Anna Helwig, RN; Michael Bloyer; Lisa Way; Sally Jeglum; Jennifer Lochner, MD. A Microsystems team there won a Davis Award for improving lab result communication. At the UW Health Belleville Clinic, a Microsystems team led by Jennifer Lochner, MD, has developed a more streamlined approach for how clinic physicians and staff communicate lab results to patients in between visits. 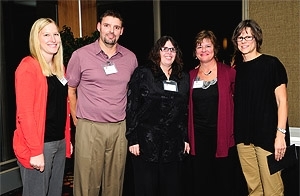 The team’s accomplishment—and the resulting improved efficiency—was recognized with a James E. Davis Award for Quality Improvement at the Renner Hansen awards ceremony on November 14, 2013. The project kicked off in January 2013 with a team meeting to evaluate current processes for communicating lab results outside of a clinic visit. In addition to Dr. Lochner, team members included: Kayce Basye, medical assistant; Tammy Bastian, LPN; Michael Bloyer, lab technician; Lisa Go, MD (resident); Anna Helwig, RN; Sally Jeglum, coach in training; Wendy Mellum, scheduler; Kim Sies, medical assistant. The team found that Dr. Lochner communicated approximately 90 percent of lab results by herself. As a result, they identified specific lab results that would be appropriate for an RN to communicate, and aimed to ensure that the RN communicated those results 100 percent of the time. Abnormal labs accompanied by a follow-up care plan for lipids, INR, urinalysis, throat culture, thyroid function, A1C, and wet prep. Throughout March and April of 2013, the team changed its processes, routing RN-appropriate lab results to Helwig via the electronic health record so she could notify patients. Dr. Lochner tracked progress during clinic huddles, and by the end of April, the team had met the goal of 100 percent RN-appropriate lab result communication. She estimates that this protocol reduces the number of lab results she personally communicates to patients by about 25 percent.